A short update this month just to let you know that both Shakes and myself will both be returning to support the 2 Bit Thugs at Glue this Saturday in Shoreditch. Expect a frenetic and fun mix of electro, gangster house and anything with a bassline from the ‘Thugs, and of course the usual dancefloor destruction you’ve undoubtedly come to expect from the Pogo DJs! In other news, it has been an interesting few months since my last email, some highlights including playing an electro swing set for a 1940s themed party filmed for ITV (transmission date TBC), and of course having finally moved in to my new house a few months ago! Of course finally having my studio sorted means that my quest to hone my production is back on and I have been redoubling my efforts to finish my Neon Highwire remix plus working on a new track I have started with Shakes – watch this space! For Saturday, as ever I have a few guestlist places available which will get you in for free. If you’d like a place either reply to this email or click here to register your interest. For everyone else it’s free before 10pm, or a mere £4 after. You can catch me playing from 10.45-12.30, and Shakes from 2.15-4.00. So it’s September, back to school and back to Glue! This month we have a very special lineup as our residents take a break and we invite back some old friends and some very exciting new ones! Headlining the night are 2 Bit Thugs, a DJ pair we’ve been hoping to get to Glue for a long time and finally they’re here! Playing a frenetic and fun mix of electro, gangster house and anything with a bassline and an attitude we think they’ll fit perfectly with the Glue ethos! 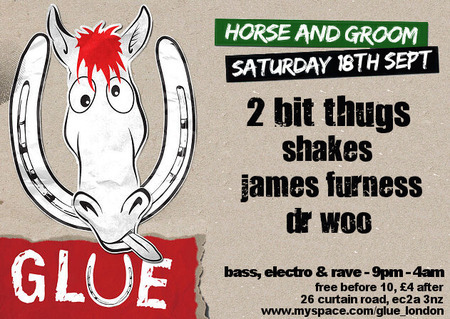 Along with the Thuggish headliners we have James Furness and Shakes, once the pair were partners known as the Pogo DJs but now their ride alone, both on a guest to find the biggest baddest basslines and heaviest party tunes. Expect a collision of electro, breaks and house. And finally opening the party we have Dr Woo, a newcomer to Glue who’ll be playing a warmup set that will run from chilled techno to full on party starters! This entry was written by James Furness, posted on September 16, 2010 at 10:07 pm, filed under Gigs. Bookmark the permalink. Follow any comments here with the RSS feed for this post. Both comments and trackbacks are currently closed.